As I let my body recover from some nagging injuries, my priorities for the summer have shifted away from triathlons and races and more towards the domestic sphere, so please humor me as I blog a little more about life, and a little less about training for a while. A while back a little video kept circulating on Facebook, something about people interviewing for “the world’s hardest job.” I never got around to watching the whole thing, (and I’m not a serious enough blogger to do anything that resembles “research”) but I think the gist of it was that being a stay-at-home mom is the toughest job in the world, and its job description would scare off many a would-be applicant. It’s a funny premise, and I can’t entirely disagree that a description of what I do day after day sounds pretty tedious: Waking up earlier than I want to, cleaning up messes that seem to regenerate themselves instantly, shuttling my child to back and forth to school while fielding endless questions (How long until our sun turns into a supernova? How much cheese can you eat before you have a heart attack? Do elephants have dentists? ), doing my best to prepare fresh, healthy meals for two guys who would frankly prefer to eat a platter of fried chicken with a chaser of Oreos every night. You know what the hardest job in the world is? I don’t think it’s taking care of your own children, or cleaning your own house. You know what’s harder than that? Taking care of someone ELSE’S kids, who’ve been raised with someone else’s rules and philosophies about discipline, diet, etcetera…Being a preschool teacher or day care worker, for example. Or cleaning someone ELSE’S house…That’s gotta be a tough job, right? Cleaning up after strangers, gaining way too much insight into their personal habits and hygiene…and doing it all for minimum wage, then going home after a long day to it all all over again for your own family. If THAT’S not one of the hardest jobs in the world, I don’t know what is. So I’ll take the cleaning, the driving, the cooking, the kiddo’s tantrums and whining, and everything else that comes with the job while I consider myself pretty darn lucky for being there for the cuddles, the discoveries, and the milestones. It’s not glamorous, it’s certainly not well-paid, but the hardest job in the world? Not even close! 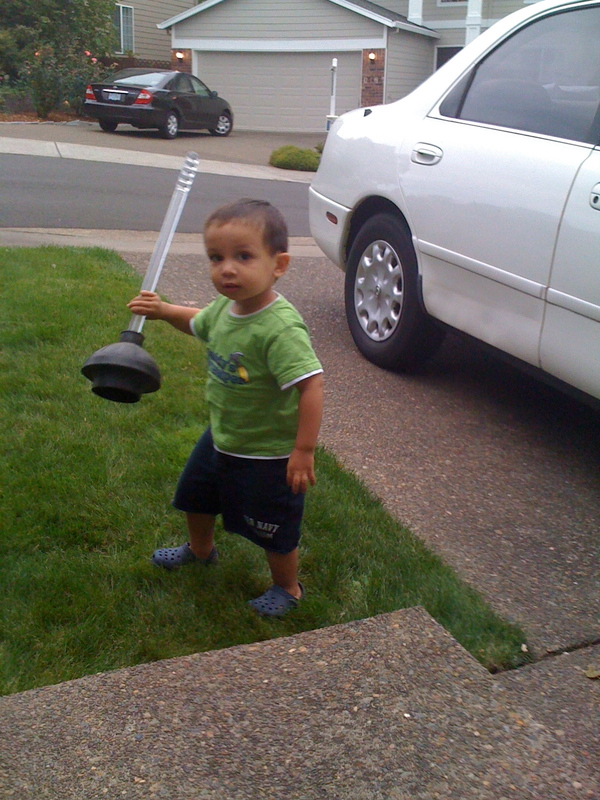 Sadly, he’s no more helpful around the house today than he was when this picture was taken.